Geocoding is included in many workflows and each workflow can vary. The score of a geocoding result to be considered a match may be higher in some workflows than in others. You may want your output to display on the rooftop or parcel centroid when displaying it on the map rather than the side of the street that is used for routing. Adjusting your locator to meet these types of needs is described in the sections below. If you are getting a lot of geocoding results back that are similar but not an exact match (for example, you have multiple units in an apartment building that are being returned as matches even though the unit number doesn't exactly match), it may be difficult to sort through the results and find what you're looking for. If you're getting too many matches, you can raise the Minimum match score, which will ensure that only the highest quality matches are returned. Conversely, if you aren't getting enough matches when you geocode a location, lower the Minimum match score to get more results. If you aren't getting enough potential matches, you can also lower the Minimum candidate score. When you lower this value, you'll get more candidates to choose from when you go through a rematching workflow. Conversely, if you're getting many potential candidates that do not seem relevant to your search, you can raise the Minimum candidate score, which will ensure that only the highest quality candidates are returned. If you want to match to a street segment even if the street number doesn't exist on the line segment in your data but is within a reasonable threshold and is likely to exist, set the Match out of range property to true. This will ensure that you don't miss a potential match because the data isn't 100 percent up to date. You may use geocoding results to display on a map or for further analysis. In this case, you can change the Preferred Location Type setting to Address Location so that the points represent the rooftop or parcel centroid for the address. The address location would then be closest to the center of the feature that represents the address. In contrast, you may use geocoding results in a routing application where you want the points to be located on the side of the street for better routing. In this case, the Routing Location option is a better choice. The routing location is typically closer to the street and would be closer to where a vehicle would arrive at the location. If you have a locator that contains data for multiple countries, you can perform a search of addresses or locations that you know are within one or two countries. You can modify the country settings to limit your search and exclude matches outside of those countries. 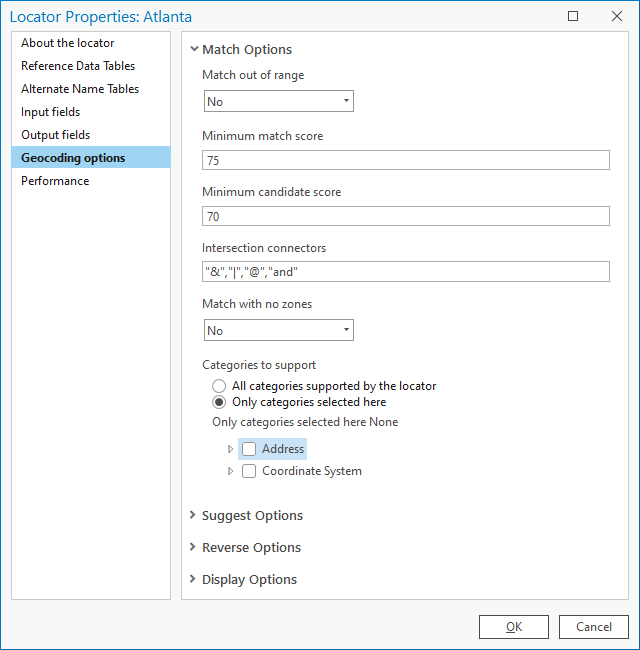 If you have a composite locator that supports multiple address types, you can modify this setting to exclude matches to certain types. For example, your locator could support matches to Point Address level, Street Address level, Street Name level, and Postal level. You might want to exclude matches to the Postal level because you consider matches to that level too imprecise for your purposes. This setting allows you to control the precision of your geocoding experience.